I was disappointed when I saw this sexism-filled letter of rejection to a would-be female Disney animator at Feministing. 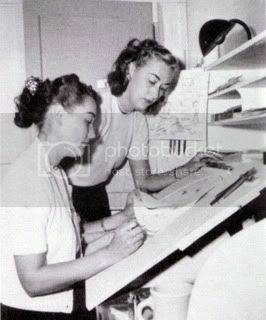 But my spirits were lifted a little when my boyfriend (an animator himself) sent me this photo gallery link to show me that Disney did, in fact, employ female animators, and so did other companies. It seems like if Disney was regressive and clueless when that letter was written in 1938, at least they were doing slightly better by the 1940s. I find it totally inspiring to see these pictures of talented women at work, so I wanted to re-post them here. With the exception of Tissa David, all of the captions come from the gallery page. "Retta Scott, Disney Studio, 1940's . 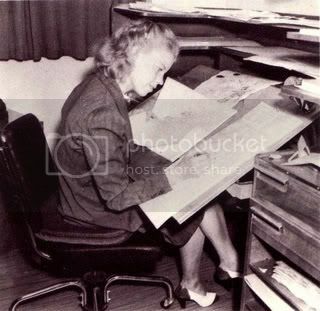 She animated on Bambi, Fantasia, Dumbo, Wind in the Willows , later on did storybook illustrations for Disney's publications. The first woman given screen credit as an animator at Disney's ." 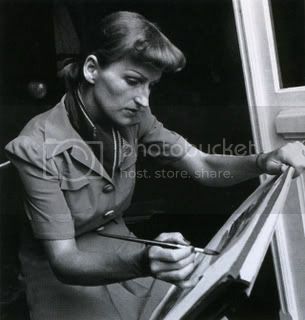 "Mary Blair at work at the Disney Studios , c. 1941"
"Marilyn and Madilyn Woods, Warner Bros. Animation, 1940's." 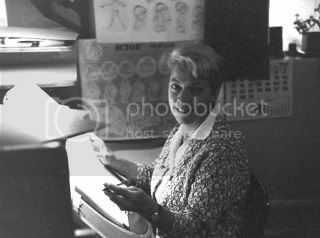 "Retta Davidson, working on "The Sword & The Stone" at Disney's in the early 60's ... left Disney in the late 60's , but later returned to help train a new generation of animators on "The Black Cauldron" in the late 70's , early 80's era at Disney." 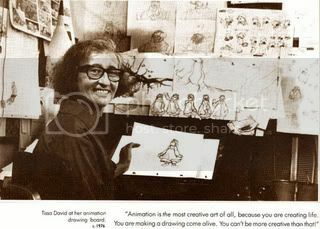 Tissa DavidFrom animationguild.org: "She was a lead animator on Raggedy Ann in 1977." 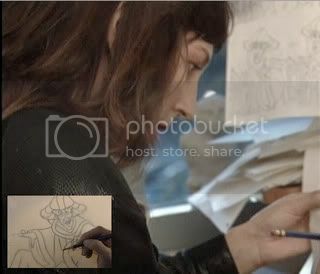 "Kathy Zielenski, animating Frollo, Hunchback of Notre Dame, Disney's 1996"
How wonderful to know about these women. Thanks. I'm glad you liked the gallery page. Just do a search on Michael's blog for "Tissa David". La Verne Harding at the Walter Lantz Studio in Hollywood in the 1940s where they animated Woody Woodpecker. "Would you happen to know the biggest feature length animations that have been made by women?" The Adventures of Prince Achmed directed by Lotte Reiniger. The Prince of Egypt co-directed by Brenda Chapman , with Steve Hickner, and Simon Wells. Spirit: Stallion of the Cimarron co-directed by Lorna Cook, with Kelly Asbury. Open Season , co-directed by Jill Culton, with Roger Allers. Retta Scott was my aunt. I still have several of her books. She visited us often during my childhood and during my 20's I would visit her home in the San Francisco area. Thank you so much for the information here. That's so neat, Gayle! She was such a trailblazer for women.